So I'll reflect and have my say. 2015 Candobetter.net Christmas Poem: "Santa's Socialism"
Said “ To me for some reason it’s not ringing true ! 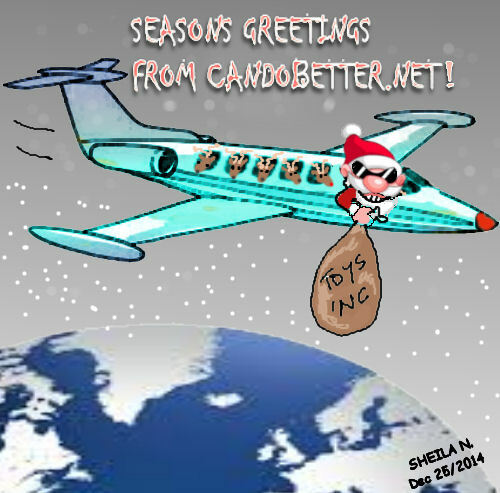 Read more about 2015 Candobetter.net Christmas Poem: "Santa's Socialism"
So I globalized activities, outsourced , off-shored and won. To punctuate our living year. including a trip to Humpty Doo. It had been like that since toy trains were new. Of his global market reaching everywhere! Read more about Toys Inc.
And we give them up and then turn on the *races. Santa is feeling the pressure of increased work as population and density of housing in cities increases. He sympathises with the nurses. Just because I’m nostalgic does it mean things aren’t really going downhill? Nostalgic memories can be dismissed as invalid, but the facts beneath this strong emotion may reveal the true direction in which we are heading. Read more about Just because I’m nostalgic does it mean things aren’t really going downhill?